Luke Johnston in the Supersport 600 race at Bishopscourt. Pictures: Roy Adams. You quite often hear weather conditions at different events being described as like having four seasons all in the same day. That was the case at Bishopscourt last Saturday when the Masters series made the first of two trips to the North. Mark Glasgow in action on his new ZX10. We had bright sun, rain, bitterly cold wind and then to top it off, hailstones. That said, the racing was really good. The two Superbike races both went to Nico Mawhinney. The first one was red flagged twice, with local man Ryan Rainey being the most seriously injured. At the minute I don’t know the extent of his injuries, so I won’t comment any further. On the re run the race was again red flagged, due to hailstones. The result was declared on 3 laps, with half points awarded. Mawhinney won, from Nikki Coates, by just .09 of a second while Dan Kneen finished in third place. Gerard Kinghan from Randalstown in the first Superbike race. Mawhinney also took the second race, this time Kneen and Coates reversed their earlier result. In the Supersport races, Antrim’s Ross Patterson took his first Masters win. Jason Lynn led from the start, chased by Dan Kneen, Luke Johnston, Nikki Coates and Patterson. Lynn and Coates tangled on the final lap, leaving Lynn in the gravel trap and Coates to cross the line first. He was later disqualified, gifting the win to Patterson. Dan Kneen was second and Luke Johnston third. The second race was also top notch. Lynn and Coates were elbow to elbow from the start, with Coates taking the win by .04 of a second. Kneen finished in third place. County Meath rider Cahal Berrill looked like he was on for a double win in the Superbike Cup races. In the first he was well ahead of Barry Sheehan and Ashley McLernon. In race two Berrill was ahead, but Sheehan just nipped past on the final run to the line, taking the win by .1 of a second. John Delargy finished in third place. Run with the SBK Cup races, the Supersport Cup gave wins to Mick Weldon and Ryan Gibson. Weldon took the first race, from Gibson and Toombridge man Padraig Graham, on a beautiful sounding Triumph-3. It was Gibson from Weldon and Des Makessy in race two. Dave Butler won both Supertwin races. Aaron Armstrong took second in the opening race, with Kia McGreevy right on his back wheel. Caolin Irwin, who was dropping 100cc on his little Aprilia, finished well in touch with Butler at the finish of race two, While Armstrong was in Irwin’s slipstream on the run to the line. Better known as Harry, Mark McConville won both Production twins races. Cathal Phelan and Alan Brown completed the podium both times. Red flagged due to a hail shower, Paul McCrea took victory in the first Pre Injection race. He led by 3.7 seconds when the flags went out, on the sixth lap. Stephen Doyle and Kevin Dempsey were second and third. A non finisher in the first race, Roger Aiken had a quick fork rebuild between races, winning the second outing comfortable ahead of James McKenna and McCrea. Dylan Lynch and Ben McBride won both sidecar races comfortably. However, the main interest centred on Derek Lynch/Michael Keogh and Terry O’Reilly/Aidan Brown, who were racing for second and third places. Lynch/Keogh got the drop both times, probably more due to the fact that O’Reilly/Brown has an engine about half the size. 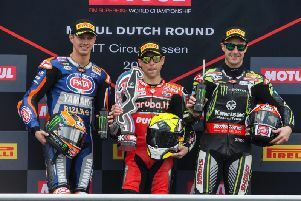 After the TT, Ulster GP, and Macau, the Tandragee has been dubbed as the ‘Fourth best road race circuit in the world’ by Motor Magazine in Holland. This Friday and Saturday sees the 56th running of the meeting, on the fabulous 5.3 mile circuit outside the Co Armagh town. Sponsored by Gerard and Siobhan Rice, the Around A Pound Tandragee 100 is now the second road race of the year, following the recent season opener at the Mid-Antrim ‘150’. The line up is similar to the local meeting with William Dunlop, Ryan Farquhar, Malachi Mitchell-Thomas, Derek Sheils, Dan Kneen, Connor Behan and foreign riders including Michal Dokoupil and his fiancée Veronika Hankycova included in the list of entries for the meeting. Also down to race is Italian Dario Cecconi, who rates Tandragee as he second home. To the extent that he has a tattoo of a map of the track on his arm! With a total entry of 330 riders and a prizefund in the region of £10,000 we can be sure of some great action. Roads close on Friday from 3-9pm, while on Saturday it’s a 10am closure until no later than 7pm.